Our white label Class 5 softswitch solution for hosted PBX has the features you need to win and retain enterprise customers. With Telinta, you can provide highly reliable business telephony services that your customers and resellers can rely on. Our Hosted PBX solution is part of Telinta’s complete suite of VoIP services focused on the needs of your business customers. With Telinta, you can offer a full range of telephony services to win and retain business customers anywhere in the world. 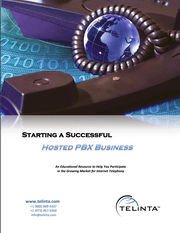 Click here to see a sample Hosted PBX webpage. Hosted PBX is a service you can provide to your own business customers around the world, enabling them to have Private Branch Exchange (PBX) capabilities, without owning costly PBX hardware. Hosted PBX is provided via Telinta’s cloud-based softswitch platform and offers a full range of features. This includes configuring extensions, hunt groups, call queues, dial-by-name directories, auto-attendant, and more. Does Telinta charge by the number of seats or extensions? No. Telinta does not charge for or limit the number of seats or extensions you can offer to your customers. Instead, we charge by the number of minutes you use for outbound calls to the PSTN. Telinta does not charge for inbound call and on-net calls between your users. Telinta offers convenient Auto-Provisioning Profiles as a standard part of our Hosted PBX solution. You can easily build your inventory of phones via your TeliCore administrative interface. When the phones are connected to an IP network at the customer premise, they will automatically connect to Telinta’s cloud-based platform to download a configuration profile. With Telinta’s Auto-Provisioning Profiles, you can avoid the need of manual configuration of IP phones. Auto-Provisioning Profiles are currently available for dozens of models from popular IP phone manufacturers, with new profiles being developed as needed. Yes. Telinta’s white label solutions include significant resources for your business to support as many resellers as you need. This includes brandable reseller portals, reporting and more. Yes. Telinta offers you the capability to offer your users a branded, customizable portal to perform a variety of self-service functions such as adding an extension, reviewing real-time call details and other features. Yes. Telinta’s Hosted PBX solution can easily be integrated with TeliGlobe, our brandable mobile softphone application for iOS and Android devices. Do you offer free voicemail? Yes. Voicemail is included at no additional charge as a standard part of your TeliCore solution. Likewise, minutes of voicemail for inbound calls do not incur per-minute usage fees. However, you may decide whether or not to charge your end users for voicemail. Yes. Telinta offers you the option of recording calls. We provide you up to 30gb of free storage for Call Recording, with attractive prices for purchasing additional storage in increments of 25gb. Telinta offers a variety of pre-recorded IVR prompts, in a variety of languages, at no charge. You can also record your own IVR prompts and upload the recording via your TeliCore administrative interface. Telinta’s Hosted PBX solution enables you to offer cloud-based multi-tenant PBX services. You can serve any size business, including companies with one or more locations, or locations which are shared by multiple tenant companies. Our highly scalable Hosted PBX solution has the tools for flexible billing and easy account creation to let you offer services the way you need.